I continue to receive requests to see more live trades. Of course, you could always join us live in the traderoom everyday to see us trade a variety of markets, both futures and forex. 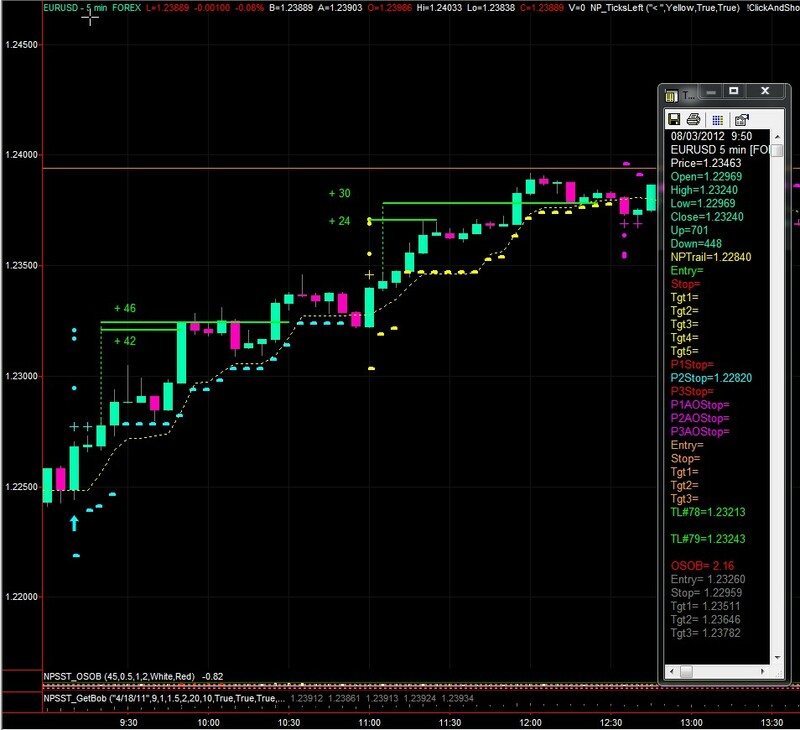 Here is a short video I recorded the other day of two trades I took while calling them live as well in the traderoom. The markets were very slow and both trades took quite some time so I edited out the ‘waiting’ time, while the price fluxuated here and there. Often these trades take just minutes but we are in the August Dog Days. As you’ll see, there’s still plenty of profits to be made. Let me know what you think. Trading is War! Here’s how we Win it!! I’ve received numerous requests to replay this video. Here it is. Don’t forget to sign up for our two year anniversary SST Pro Release Party! You still have a chance to own this powerful trade weapon. Win the war of trading as we’ve been doing for the past two years with the SST Pro. August is always a challenge but today ended strong for several markets. EURUSD and AUDJPY ended with strong winners today. The Russell fought back to end positive too, for the session and the week. Today’s post is all about Wheat Futures, though. So you’ve probably heard that this is the LAST AND FINAL Seven Summits Trader Public Release… ever! And so I’m betting you want to know more about this system that’s proven itself over and over for TWO years straight? What better way to get to know the Seven Summits Trader than see the replay for Wednesday’s live demo on the live markets! Couldn’t make it live? Click the Play Button to see the SST will FLY or FAIL in the face of live market action (spoiler alert: it’s been producing for the last 730 days so it’s going to ‘wow’ you in this demo!). In the replay, we show the SST on some of the most common markets that you’re probably trading now… and some of the more uncommon markets to prove just how versatile and powerful this trading method can be. AUDJPY 5 Minute Chart — Long, slow trade still going as of this writing. So Far, 25 pips of profit. Russell eMini: We took two partial winners, the first of which missed its full target by just a single tick. I let the trade run but normally would be aggressively exiting with part of my position. EURUSD: Had a great winner that ended later in the session for +45 pips. We’ll be posting the video of yesterday’s live demo shortly. If you missed it, don’t worry because you’ll be able to relive it again with the video. There were many great trade opportunities that we presented. I thought I would follow up with one trade in particular though, since the demo ended before the trade was able to pick up speed. If you were there yesterday (if not you’ll see it in the video), you’ll remember that the EURUSD was practically comatose with hardly any price action. The SST Pro did put us into a long trade however, which seemed like it was just going to flatline until ‘who knows when!’ Shortly after our demo ended however, the market picked up steam and not only went to full target, but also gave us the chance to ADD to our position for another full target winner. 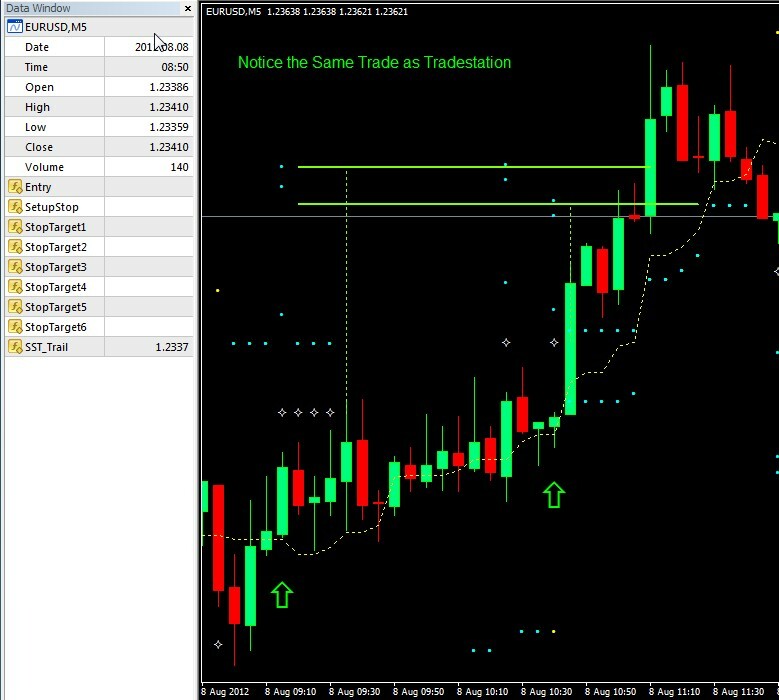 You can see the full trade below on both Tradestation and MetaTrader 4. Like Yesterday’s examples, notice the accuracy of the targets. We took what the market wanted to give us during very slow trade conditions and very little price range. Our standard SST Tradeplans for some of our favorite futures markets were able to get it done with just a few trades this morning. Modest gains are good in a slow August market. Add to that some simple market diversification and you have the winning formula that will carry you through all sorts of market conditions. Let’s book our profits and then get outside to enjoy what’s left of summer. 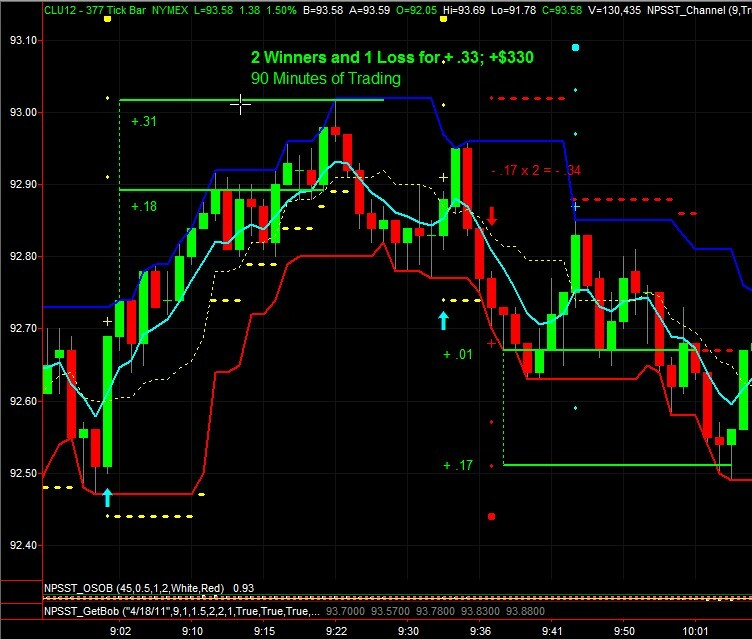 Take what the market wants to give you as we did with our Russell eMini trades this morning. Crude Oil also Delivered Modest Gains but That’s Exactly how we Build our Accounts. It’s what the Market Offered us Today. Notice the Accuracy of the Targets on the Two Winners! 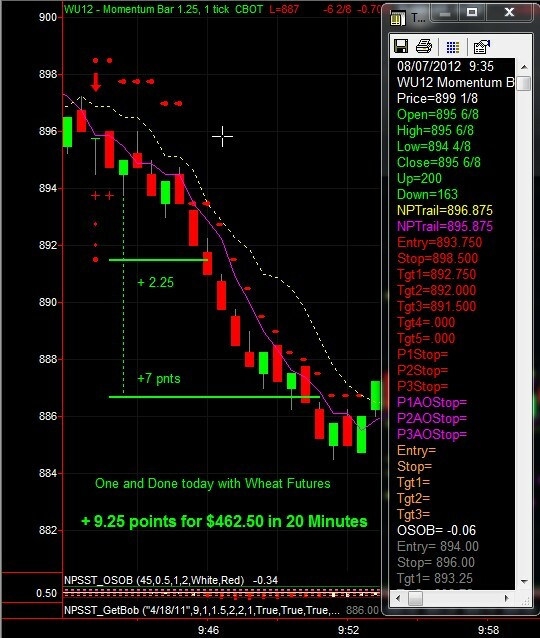 Wheat Futures only Requires 28 Minutes per Day or LESS! We finished in 20 Minutes Today.. One and Done with our Futures Profits in Hand!! The Dawg Days of August are definitely upon us, yet after a slow start to the week, we finished last week’s EURUSD Session on a very strong note. It only took 4 trades, 2 on Thurs and 2 on Friday to finish with +136 pips for the week. Friday, after the big Non-Farm Payroll report came out, EURUSD rallied and we gained +147 pips on 2 trades. Keep in mind, we did this with a 5 minute chart, using the plan we’ve been using for nearly 2 years. Notice how easy these trades look. All SST Pro Trades look the same way. The plus sign is your entry level. The 3rd dot above it is where we exit half our position. It is a target that the SST Pro Calculator ‘tunes’ to current market conditions to give us the BEST chance for success. Notice also, the dynamic stop and how it quickly moves to cut risk. When the price hits the first target level, the stop is set to move to lock in 1 pip to cover our spread costs and put us in a risk free position. It then continues to trail as the trade progresses. Like this, we can turn a normal 20 or 30 pip trade into a 100 pip trade, or more. We trade to make money. For us that means being flexible and willing to ‘take what the market wants to give us’ on any given session. That’s what the SST Pro is designed to do. Hope you had a great weekend, after a very eventful and profitable week of trading. Today I want to start showing off some of the power tools that we have built into the SST Pro Calculator. We have loaded the SST Pro Calculator with tools that help simplify our trading. It clearly shows us the trade setups, as you have seen throughout this blog. What you may not yet know is that there is quite a bit more horsepower under the hood of this baby. Some of the power tools that come fully deployed within the calculator include a set of trade filters that help us weed out undesireable trade setups. These trade filters have helped us add to our overall profitability in many different ways. We’re all about putting the odds in our favor on every trade, and the SST Pro is designed to do that. But the price action of markets is infinitely challenging. There are some patterns that occur that reduce our odds. Sure, the odds are still good, but we trade to make money and if we can better our odds, or identify setups where the odds are not quite as good, then we’re going to react accordingly. We only want to take the BEST setups. After two years of using the SST, we’ve learned a lot about how this method works as well as ways to make it work even better. We also have a very active Membership of experienced traders and we have taken their best suggestions and added them to the SST Pro, making it even more robust and effective than ever. 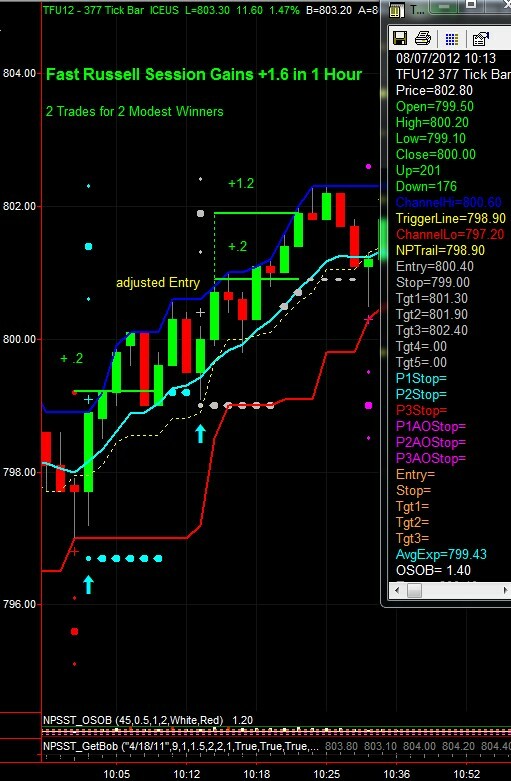 One of the very simple trade filters we have added is the “Mustard Line” which came to us from one of our members who had found great success by using it. We conducted our own testing and concluded that it did indeed, help improve the results of some markets and timeframes. Here’s a short video that will show you how the Mustard Line works. We’ll be showing you brief demos of some of the other trade filters we have included in the new and improved SST Pro Calculator, amongst other things. If we can mitigate and avoid just some of the choppy price action, than our bottom line is going to be that much higher up the profit scale and more profits make for happier traders. That’s what we want! And that’s what we get with the powerful chop filters that come fully wired and ready to go with the SST Pro. Check back again for a look at another one shortly. Forex Daytraders have had to be patient this year. We have seen our favorite daytrade markets really contract and trading ranges have not really been that great for daytrading forex. Our tried and true tradeplan for the EURUSD 5 minute chart has managed to hold its own this year, despite the challenge of low range price action. We have found that our aggressive breakeven trade maneuver that we use as part of our plan has kept us close to record profit levels throughout the year and as we do pick up winners, we are steadily growing the equity curve, and hitting new equity highs on a steady basis. Yesterday (Aug 2) we finally grabbed the type of trade that we were accustomed to last year. The SST has the uncanny ability of putting us on the right side of big moves. Yesterday was no different. As comments were coming out of the ECB, mixed in with some surprising US economic reports, there were some large moves both to the upside and then to the downside. 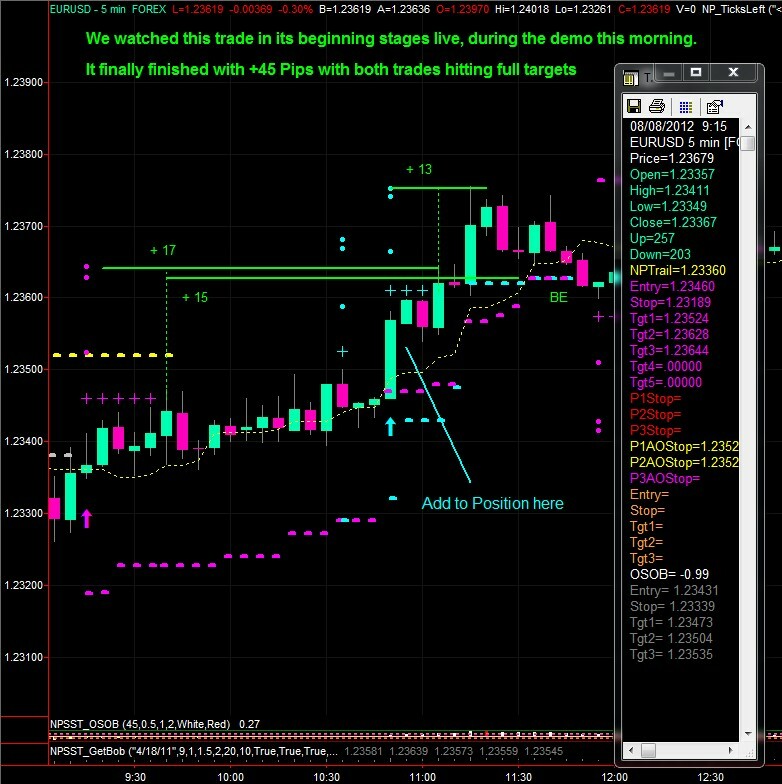 Check out the trade we took on the EURUSD today in the traderoom. EURUSD; We grabbed the short trade which occurred shortly after our morning start time and grabbed +102 pips. We used to see this kind of trade quite often last year (see chart from a year ago below). This year we’ve been in “grind it out” mode. hopefully though, we will see the daily trading range begin to expand as we head into the last part of the year, with the US elections promising to provide firepower to price action. You’ll need something like the SST Pro to be sure you are on the right side of the major moves. Some of our European Members have been trading the EURUSD a bit earlier and have enjoyed some consistent nice moves as well. Notice how the SST signalled in the long trades that occurred just before the shorts that we took. 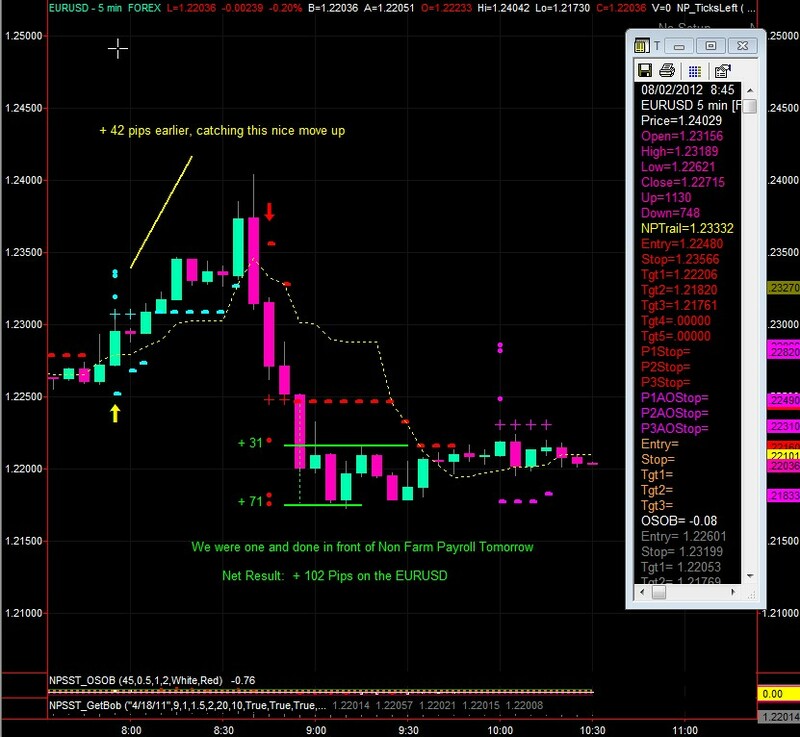 Now check out the trades we took on the EURUSD exactly one year ago , on August 2, 2011. Notice how the SST is behaving the same way today as it did a year ago. This trade was the beginning of a very profitable run that had us finishing the year up over +2000 pips, using the exact same tradeplan we use today during the early part of the US Session. Could we get a repeat performance to finish 2012 with the EURUSD? With the consistency that we’ve seen with the SST Pro with all our best daytrading markets, my bet would be yes. The EURUSD could be waking up again as we move into the most volatile part of the year. Don’t be afraid! A volatile market means big profits for us as the SST Pro continues to put us on the right side of the best moves and EURUSD SST Traders are going to be big beneficiaries.